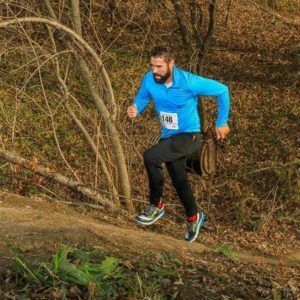 Dr. Andy Strachan running the Sycamore 8 trail race in December 2016. 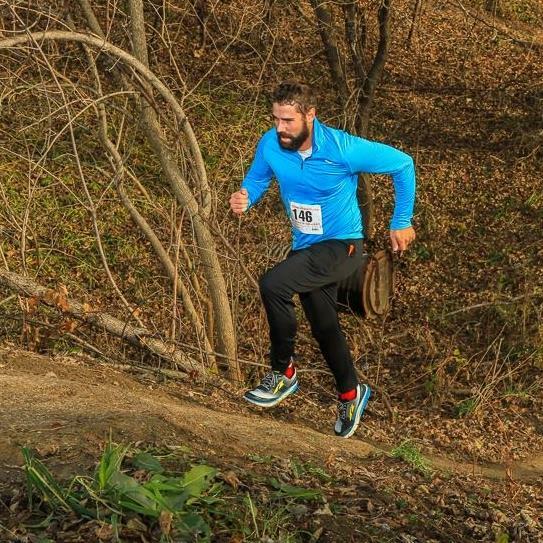 For many runners, wintertime marks the midpoint between cross country and fall road racing and the upcoming track and spring road racing seasons. While the chilly weather may have you dreaming of your sofa instead of your stride, winter can be a perfect time to prepare for a strong spring. Here are five things every runner can do to train – even on the coldest days. 1. Address your weaknesses from last season. If that weakness turned into an injury, the winter would be the perfect time to speak with a healthcare professional who specializes in running about some exercises you can do to overcome the weakness that ultimately led to you being injured. If you are like most people, you want like to spend as little time outside in the cold as possible. On those frigid days, opt for indoor work on the small things that will help keep you injury free. First, work on increasing your range of motion (ROM) and mobility by foam rolling and dynamic stretching. These are two things that many people overlook in the offseason. By improving mobility, chances are your running form will improve and any compensations you developed during the fall season will start to diminish. Recent studies show that foam rolling alone helps to increase ROM*. However, I suggest going through a dynamic stretching routine immediately following a foam rolling session. If you are able to load the tissue you just lengthened via the foam roller, you will get a longer-lasting effect. 3. Don’t ignore your pain. “No pain, no gain” is a common phrase used by coaches and trainers. While there is some truth to that mantra, it is best to listen to your body – especially during the off-season. If you start ignoring aches and pains during the winter months, those small aches and pains will likely turn into full-blown injuries by spring. Winter recovery is as important, if not more important, than the training itself. Once you start ramping up mileage, adequate rest is important for muscles fibers to strengthen and recover. 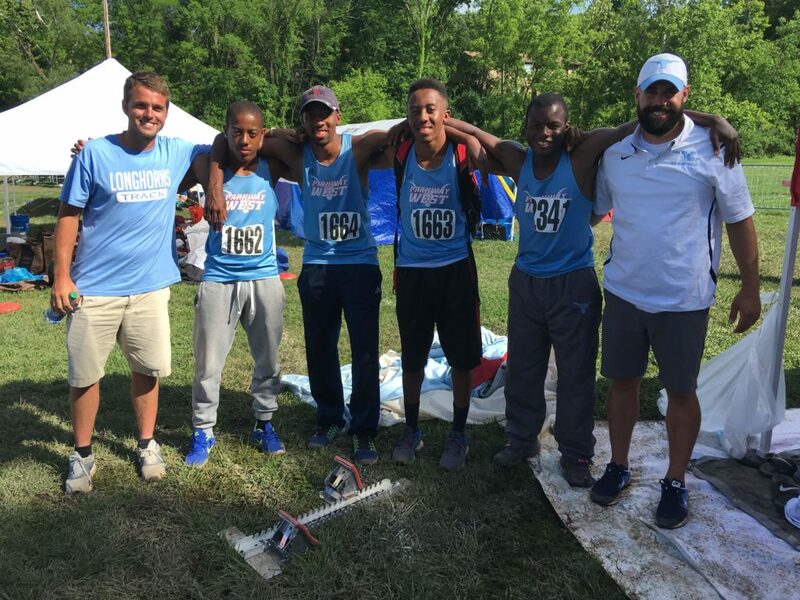 Dr. Strachan (right) and the Parkway West High School 4×100 meter team, pictured at the 2016 Missouri State track meet. Dr. Strachan was the team’s sprint coach. The most important tactic for winter training is consistency. Establishing a consistent workout routine will make it easier to get motivated to get out into the cold. On days it is too cold or you just don’t have the motivation to run, it is still important to do some sort of physical activity. I suggest doing something other than running, like strength training, basketball, or swimming. Physical activities that require change of direction or jumping will strengthen supporting muscles that aren’t commonly used while running. I hope these five tips will help to make your winter running season a success. If you would like a personalized running evaluation please schedule an appointment by visiting our website capitalchirodsm.com or calling the office at 515-421-4018. *Cheatham, S. W., Kolber, M. J., Cain, M., & Lee, M. (2015). THE EFFECTS OF SELF‐MYOFASCIAL RELEASE USING A FOAM ROLL OR ROLLER MASSAGER ON JOINT RANGE OF MOTION, MUSCLE RECOVERY, AND PERFORMANCE: A SYSTEMATIC REVIEW. International Journal of Sports Physical Therapy, 10(6), 827–838. Kelly, S., & Beardsley, C. (2016). SPECIFIC AND CROSS-OVER EFFECTS OF FOAM ROLLING ON ANKLE DORSIFLEXION RANGE OF MOTION. International Journal of Sports Physical Therapy, 11(4), 544–551.